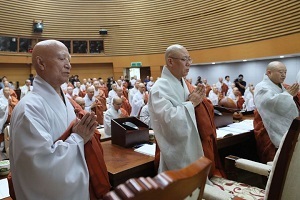 << Seoljeong (left), president of South Korea's Buddhist Jogye Order, attends its central committee at the Jogyesa temple in Seoul on Aug 16, 2018. With more than 3,000 temples, 13,000 monks and seven million followers, the Jogye Order is followed by most of South Korea's Buddhists and is highly influential in a country where religion remains a powerful social force. But it has long been dogged by corruption allegations and factional feuds that often make the headlines. The order elected a new president on Friday named Wonhaeng. But he stood uncontested after three rivals boycotted the ballot. The rivals accused a powerful and scandal-tainted former president named Jaseung of unfairly pulling strings in favour of Wonhaeng. Jaseung's eight-year leadership of the sect, which ended in 2017, was marred by allegations of corruption, gambling and broken celibacy. His successor Seoljeong then resigned last month after just nine months in office amid allegations that he forged his academic credentials, amassed vast wealth and fathered a child. Seoljeong's resignation has been demanded by many rank-and-file members and civic groups who have staged numerous protests. On Friday, representatives from from 26 pro-reform groups rallied outside the Jogye denomination's headquarters in central Seoul, calling for the cancellation of the leadership vote. "This election has already become null and void with the resignation of the three other candidates," the group said in a statement, adding that the 318-member electoral college was acting like a rubber stamp for Jaseung. They urged Wonhaeng to step down voluntarily and called for a direct referendum by lay members to elect a new president. "Under the current system, even Buddha himself would have no election chance", leading activist Chang Duck-soo said at the rally. But Wonhaeng, who won more than two-thirds of 315 ballots cast on Friday, said his election had been democratic and that his critics should accept the outcome. "I will do my best to have (the denomination) fully restore its Buddhist virtue", the 65-year-old senior monk said at a post-election press conference. In 1994 the sect's main temple in Seoul was the scene of violent clashes between rival factions of monks over control of the order's executive posts, with many monks and riot police injured. What is now South Korea was for centuries predominantly Buddhist with the Jogye sect coming to dominate. But the late 20th century saw huge economic and social changes including enormously successful proselytising by Christian missionaries. A 2014 survey by Korea Gallup showed 22 per cent of South Koreans identify themselves as Buddhist, while nearly 30 per cent are Christian.